Tributes, something cool is coming for The Hunger Games: Mockingjay Part 2! 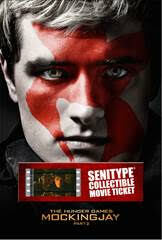 Senitype, a company that sells limited edition collectible movie tickets, has put up special Mockingjay Part 2 collectible Senitype tickets for pre-order via NewEgg.com. The tickets, which are redeemable for up to $13.00 to see The Hunger Games: Mockingjay Part 2, cost $10 each plus shipping (I admit, I bought Katniss, Peeta, and Gale before coming to post this…) and are good at participating US theaters. 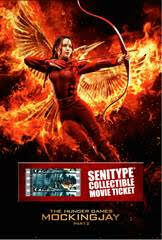 In addition to these tickets, Senitype also has Senitype Super Tickets, which sells for $29.95 and contains the movie ticket plus a code to own the digital download when available. 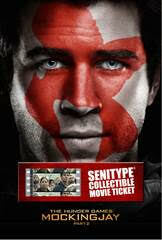 For diehards who want the complete collection (4 movie tickets plus the Super Ticket), Senitype is selling this for $69.95. 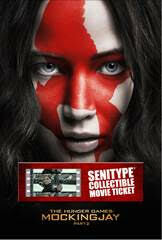 Senitype has given us one of their Limited Edition movie tickets, so if you want to own a piece of Mockingjay Part 2 history, be sure to enter below! 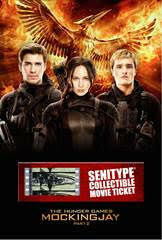 To enter, go to Senitype’s website and tell us which ticket you’d pick if you won. After that, log your entry into our Rafflecopter widget and you can access our other entry methods! May the odds be ever in your favor! Please note tickets are only valid at participating US theaters, but this giveaway is not limited to those who can redeem it. Open to US residents only. Giveaway ends on November 17, 2015. Tickets must be redeemed by December 31, 2015.